Tool, biobanking, meta-data, data, miabis, open source. Individual level data ready for analysis. Increasingly bigger datasets are required for epidemiological and genetic analysis; hence it has become important to enable pooling of data from multiple biobanks. 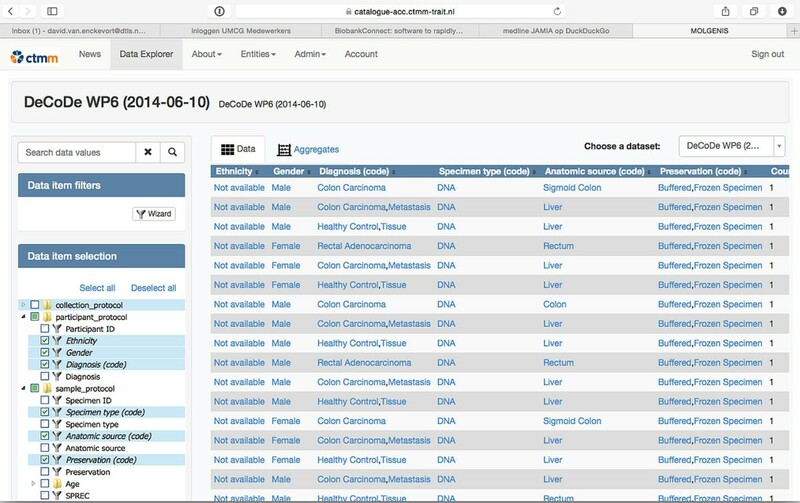 Therefore, the catalogue also comes with BiobankConnect, a tool to rapidly match data elements across studies and biobanks based on lexical matching and ontologies . MOLGENIS/catalogue is build on the open source MOLGENIS platform  and offers pre-build components that allow users to upload data in a simple Excel format and supports any data model through a meta-data definition in the Excel file; to visualize the data in aggregated or tabular form; to share securely data through a comprehensive security model and to integrate data from different domains (Figure 1). MOLGENIS/catalogue data explorer for the DeCoDe study. Users can filter, aggregate and drill down on available data.